“I’ve suffered with prostate issues for the last 5 years and wanted to start some leisure riding with friends at weekends, 60/40 off road tracks/road. I went to buy the bike I’d researched and chosen but after sitting on it in the shop for 5 minutes I was in no doubt I wouldn’t be able ride it without being in too much pain. I didn’t buy the bike. I then did some research on saddles and discovered the Rido saddle. I went back and bought the bike, changed the saddle and now ride for 2-3 hrs every weekend. I don’t feel my prostrate at all when riding and the saddle has enabled me to ride every weekend. 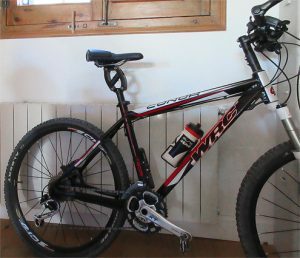 “Just to say I have safely received the R2 I ordered and now have it on the bike – wow, what a difference! Since putting it on, not only do I feel ten times better when I’ve finished cycling but a persistent back pain while on the bike has almost disappeared completely. It certainly feels different and you can instantly tell what the design is doing in terms of redistribution of the pressure points. The other thing I wanted to mention is that I have combined the R2 with a Cane Creek Thudbuster suspension post and I have to say that that is spectacular as well. It’s not cheap and certainly not pretty but again, the effect is astonishing. With these two elements together I can say without any doubt that my riding experience has been transformed! Thanks to the Rido PCF Special Edition R2 saddle you sponsored me with, I was able to complete the full 24 hours on my indoor trainer. Not only that, but I was able to cycle the furthest distance, 731 km’s to finish top of the leaderboard! This would not have been possible without your help, so I’m truly grateful for your sponsorship. Thanks so much again. I’ve already been very vocal on social media about the R2 and know other Zwifters have ordered them, so I’ll do another round of posts about this recent 24 hour marathon. “Somewhere you say, it feels different to ride a Rido. Man, what an understatement! It’s not different, its an experience. I plop the aaddle on the bike 5 minute before ride started. For sure I will re adjust it, but man, after 3 years non riding my bike, doing a casual ” mass critical ride” of about 15 miles, I could easy double the distance, I have NO, NOTHING, ZILCH SORENESS. NOOO NUMBNESS wow wow, what an amazing saddle. Thank you for all the information on your website. I’m from South Africa and enjoyed every bit I’ve read here. On the page of cross training (it was the only reference in all the hours of reading) it was mentioned that as men get older (and I’m old already!) we lose muscle. Now that is common knowledge. The article continued to say that a bit of weight training can reverse this so I will definitely make that part of my routine. My reason for writing, however, is your page on preventing saddle soreness. I will include your tips on cream. However, right under your noses there is a manufacturer of the best bicycle saddles in the world. Please visit http://www.rido-cyclesaddles.com. I’ve imported mine recently and used it for my first ride after a 3 year period off my bicycle due to injury. My intention was a 10 mile ride and I ended with doing 30. If it had not been for time constraint it would have been longer. What a serious surprise: no numbness, no soreness. I climbed on the bike the next day expecting the normal sting. I ended up doubling my intended distance again, still no bottom pain. After testing the Rido saddle I’m confident you will be adding it as saddle of choice. Just be cautious though: the GB cycling team might be upset that they weren’t already issued previously with it! 🙂 No I’m not an advertising agent for Rido, neither getting commission or getting discount prices. I bought two and, as explained above, I had derived huge benefits from the saddle. I think it is also worth mentioning that the 2nd saddle was bought for my son-in-law who, due to a serious motorcycle accident, lost his right arm and also has various other challenges including serious damage to his coccyx bone. For him pain has been a part of cycling, until now, after doing MTB riding, he climbed off the bike after 40miles without the usual pain. Hope my lengthy writing didn’t irritate you, but get the saddle, test it and surely you will be as amazed as we are. “Excellent – (R2) totally eliminated the acute coccyx pain that I suffered with my previous saddle. “Thank you so much for contacting me in regards to the shipment I appreciate anything you can do to help with lessening the cost of shipping. Love your product have several of these saddles struggled for many years tried many different saddles by far yours is the best. I am able to ride 12 hours straight and still ride again the next day. “I previously ordered a saddle (R2) for me and am thrilled with the comfort. “Hello, I love the saddle!!! I bought it in July I believe. From January of this year, I developed very painful coccyx pain, probably from my office work. Occupational therapy recommended a special tailbone cushion for me, so when I started to feel the pain when cycling, I thought there must be another kind of saddle I can get. Yours is the only kind I could find, especially which was for leisure and commuting (rather than racing or ‘performance’) and that was just as suitable to women as to men. On my old saddle, which was very old, riding had become very painful….I commuted about 8 miles each way to work about two or three days a week and towards the end on my way back, after a day at the office, it was very painful when I shifted position or got off. The Rido has taken all that pain away. The first time I used it, it felt rather strange and I thought it was painful on my sit bones… but after I found a good position, it wasn’t at all. When using it, there is no pressure on my tailbone because there is nothing there under it. The pads under the sit bones are firm and keep me in a good position, and i’m very comfortable on it. Soon after I got the saddle I rode, over three days, from Brighton to Oxford, by myself (which I’m very proud of). It’s my most epic cycle adventure so far and my tail bone was absolutely fine the whole time. I have been on other long day rides since then, mostly on road, and it’s been great. I am very protective now over the saddle, and always tie a plastic bag over it, both to protect it from the elements and from the dreaded theft (! ), as I have no indoor storage for my bike. So, yeah, I’m very happy with it. It has been worth it and I’m glad I took the plunge. I’m on a pretty small budget so I wasn’t sure, but it has been worth it so that I’m not cringing in pain when doing something I love. “I’ve been putting in about 80 miles a week on the Rido saddle since I got it. Have made two slight position adjustments since the purchase to get it just right. The ride is as painfree now as it was out of the box. I actually had forgotten that a had seat pain in the past til you reminded me…..
“I love my Rido! After years of riding with a regular saddle, I developed Prostatitis and would not go near a bike for years. I began using a noseless saddle a few years ago, which was okay, but it felt awkward I could not even drive [sic] one handed. No fun. 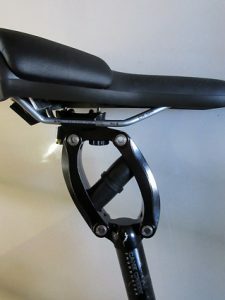 Now, I can drive [sic] for hours with the Rido without any problem, and it feels like a regular saddle! I’ll try out the Rlt too, I just can’t decide for a color. The only improvement I can think of is the option for a completely white and a brown Rlt, a (faux) leather version of the R2 and Rlt would be nice too. Feel free to use my (anonymus) feedback on your site. (1) “It (RIDO R2 saddle) has saved me as far as riding a bike is concerned…. I would have had to give up riding had it not been for your seat. “Seat heaven” …. to be continued! “Like many other cyclists, I have been experimenting with saddles over the years, sometimes with more success than others, but settling on none, for eventually discomfort brings another hoped-for solution to a sore conclusion. Yesterday while riding with some friends I saw that our leader had a new saddle, a brand which I had never heard of. He said another of our regulars had tried one and found seat heaven. Upon inquiring he was told that this marvel was a Rido from England. So he ordered an R2 in the new brown shade and said not only did it solve his seat discomfort but looked good on his green Waterford frame. So when I got home I found your website, read your claims and testimonials, and decided I would try one out. “Yes, the saddle performs well. The original one I bought developed an annoying squeak on the left rear corner but I got a replacement which seems to be going well so far. 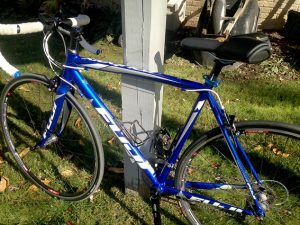 I swap the seat and post back and forth between a road bike and mountain bike (pictures attached). Because the MB is more upright position it seems to be the best in terms of perineal comfort versus the more forward leaning road bike riding position. I typically ride 25 miles each time out, nothing too extreme. I used to ride a lot of hills (not hard to find where I live) but not so much lately. Overall, I would say the seat does everything it’s billed to do and has provided great relief down there. It’s keeping me on the road so that’s all I could ask for.